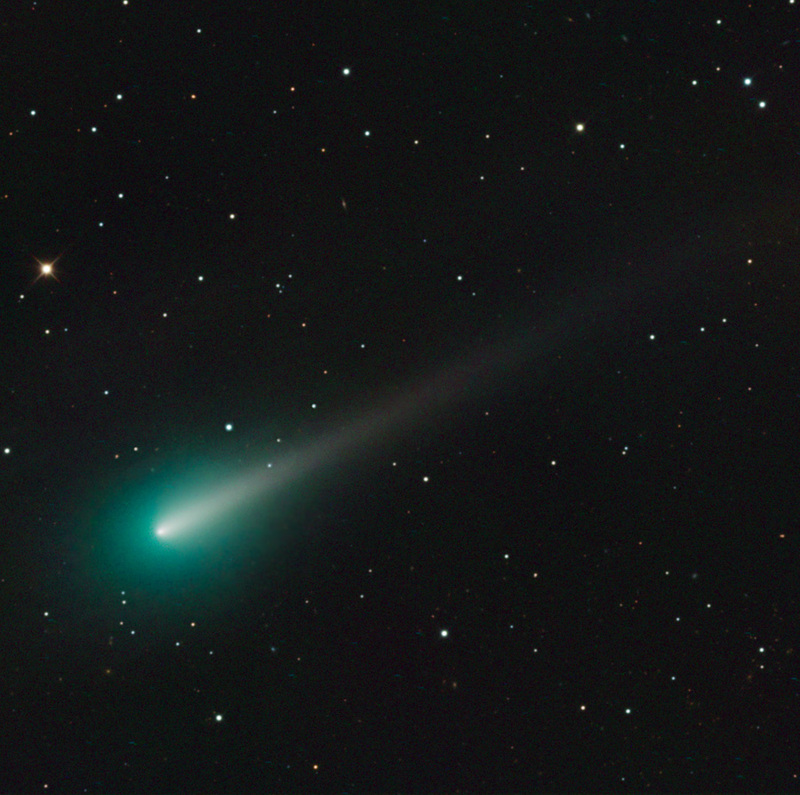 Astronomers around the world were waiting this past week for a mighty comet to come swooping past the earth. The comet, called ISON, was first discovered more than a year ago and astronomers, both professional and amateur, have been following it ever since. Many sky watchers were excited about the prediction that it might provide an amazing display in the sky during the holiday season. But that just didn’t work out. apparently familiar to astronomers and accepted by them as all in a night’s work. Much information can be learned from the progress of comets and their disappearance so all is not lost if they fail to flame across the sky and make the TV news. I’m afraid I don’t know enough about astronomy to know what they will be learning, but I wish them well. You can learn more about ISON from the website Space.com . News about the comet reminded me of Caroline Herschel, who worked with her brother William, and specialized in discovering comets. Caroline Herschel was born in Hamburg in 1750; William was twelve years older. The Herschel family was chiefly interested in music, not astronomy, but both William and Caroline wandered into the world of science. William was a successful organist and he sought escape from his strict German family life by moving to England. A few years later, in 1772, he sent for Caroline, his youngest and most congenial sister to join him. She was pockmarked from smallpox and her growth had been stunted by early illness, so her family considered her unmarriageable. Caroline managed William’s household (which included another brother, Alexander), kept the accounts, and learned enough English to do the shopping and supervise the cook. William was then left free for his job as organist and choirmaster at the Octagon Chapel in Bath—and most importantly for his secret passion—observing the stars. 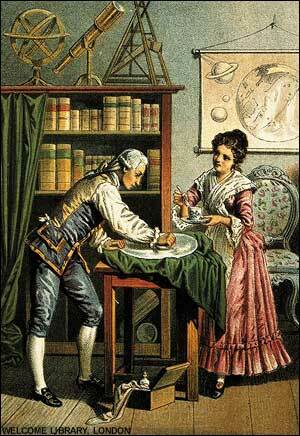 Caroline and William Herschel at work. William built, with Caroline’s help for some of the polishing. It was far more powerful than the telescopes most other astronomers were using at the time. Night after night the two of them would stand on the lawn with their telescopes watching the planets and stars and keeping track of everything they saw. To keep warm on cold English nights, Caroline would wear layers of petticoats under her skirts. Caroline’s task was to write down the information that William called out to her as he methodically swept the telescope across the sky. This saved him from having to take his eyes off the stars and adjust his night vision. In between her duties, Caroline was observing the sky herself and learning more and more about how the stars and planets moved. Ten years after Caroline moved to England, William was offered a position as the King’s Astronomer to King George III. He and Caroline moved to Dachet and later to Slough where they could concentrate just on astronomy. They worked as a pair and Caroline specialized in discovering comets. She discovered eight comets during the 1780s and was recognized as William’s assistant given a small pension by the king. Caroline’s life became more complicated after William married in 1788 and Caroline no longer ran the household. However, they still worked together as astronomers. After William died, Caroline moved back to Hanover in 1822. Then at last she began to get some recognition. She was awarded a gold medal from the Royal Astronomical Society in 1828. At the age of 96, in 1846, she received another gold medal from the King of Prussia.